It took the Chinese engineers months to choreograph the best intersection point. In the end, the tunnel, deep below the Badaling section of the Great Wall, passed experts' appraisal, state-run People's Daily reported. The line is designed for trains traveling up to 350 km per hour, which is expected to shorten the single-journey time from more than 3 hours to approximately one hour. The line is estimated to be completed in 2019. The depth of the tunnel will range from four meters to 432 meters. Luo Duhao, chief engineer of the Beijing-Zhangjiakou High-Speed Railway Line, being built by China Railway Number 5 Engineering Group Co said the frim will employ "precision micro-blasting" technology, which has a velocity of 0.2 cm per second and is able to make the tremor weaker than the traditional firepower blasts that have a velocity of 5 cm per second. "The new technology causes little damage to the geological environment, which will help protect the Great Wall," Dai Longzhen, deputy manager of the Beijing-Zhangjiakou High-Speed Railway Line, said the Global Times. "I myself once stood on the Great Wall and I could not feel the blast at all," Dai added. Zhang Xuehua, a blast expert at the construction site, told the People's Daily that the construction of the tunnel has completed 4,500 blasts since early February this year. In the middle of the tunnel, workers will build a spacious and well-decorated station right under the Great Wall, with a record-breaking construction space of 36,000 square meters, the Xinhua News Agency reported. The station will be 102 meters below the surface of the Badaling Great Wall. Dai said the construction area and the depth of the station is "record-breaking." He said that because the station is built underground, it will cause less damage to the plantation, and it also demonstrates China's top-notch railway construction capabilities. Built from the third century BC to the Ming Dynasty (1368-1644), the Great Wall stretches over 21,000 km. Over a four million tourists visit the Great Wall every year as it is the centre of China's tourism campaign. 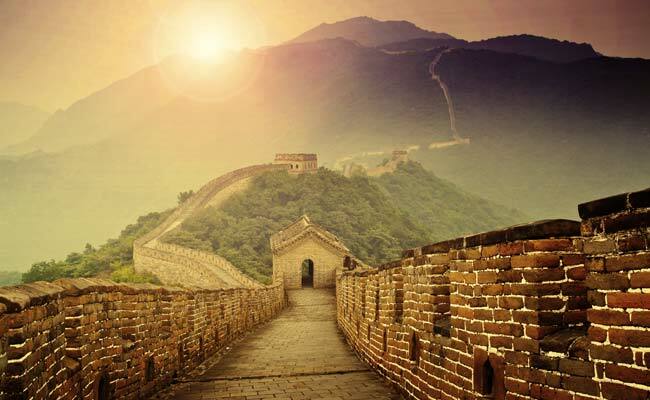 According to official statistics, about 30 per cent of a 6,200-km section of the wall built in the Ming Dynasty has disappeared, and less than 10 per cent is considered well- preserved.